Please click here to download the PDF version. The research project NOTAE aims to investigate the presence of graphic symbols in documentary records as a historical phenomenon from Late Antiquity to early medieval Europe and represents the first attempt to conduct a research on such topic. ‘Graphic symbols’ are meant as graphic signs (including alphabetical ones) drawn as a visual unit in a written text and representing something other than a word. They therefore broadly cover the semantic spectrum of the Latin notae (signs) as opposed to litterae (letters of the alphabet). The sources – just indicated as ‘documentary records’ – are written texts generated for pragmatic purposes: as expressions of the pragmatic literacy in the meaning proposed by Malcom B. Parkes («literacy of one who has to read or write in the course of transacting any kind of business») they are therefore documentary records of all possible kinds (legal contracts, petitions, official letters, private letters, lists, authentics from relics etc. ), survived in original or in contemporary copies on papyrus, wooden tablet, slate, parchment (inscriptions and graffiti are excluded) from the long period in question, for which we have to consider different levels of literacy and of documentary practice, and consequently different questions about production, use, storage and transmission of documentary records. With the gradual introduction of signature and the increasing use of papyrus from the 4th. c., the presence of graphic symbols became widespread in legal documents as it already was in other written records (christian letters e.g. ), and continued in post-Roman kingdoms as part of the same historical process of reception of the late antique documentary practice. For the period in question the external feature of the graphic symbols is not particular noticeable within the graphic texture of the written text in Greek or Latin cursive. The ‘technology’ requested in drawing them is the same for writing a text: a human hand tracing thin lines. The phisical act of drawing symbols in written documents had a major social impact, because, provided it was done in one’s own hand, it placed on the same footing literates (professional scribes, bureaucrats, economic élites) and illiterates. For illiterates, it certainly meant a way of taking an active part in the writing process both in the late Roman state – that is in a Greek-Latin graphic and linguistic koinè – and in the post-Roman kindgdoms as long as Latin functioned as language of ‘vertical communication’. Latin remained the common language of communication for a long time in the West; it ceased to have any effect as a language of vertical communi¬cation between the 8th. and 9th. centuries, at different times and phases in different parts of Europe: this represents the fundamental premise to assume the ability of illiterate listeners in the early medieval Europe to understand latin texts read aloud. It implies that illiterate people participating in legal proceedings in Merovingian France or in Lombard Italy or in Visigothic Spain were like illiterates of the late Roman state, and that graphic symbols drawn by illiterates in these circumstances in the historical span in question are comparable. For the period in question the external feature of the graphic symbols is not particular noticeable within the graphic texture of the written text in Greek or Latin cursive. The ‘technology’ requested in drawing them is the same for writing a text: a human hand tracing thin lines, as can be seen in the following Figures 1–7. Fig.1: Hermopolis, Egypt, 561: graphic symbol in complex structure at the end of the autograph subscription of a greek notary. Fig. 2: Ravenna, Italy, 572: autograph symbol (greek cross and diagonal cross crossing each other) of the illiterate seller Domninus. Fig. 3: Ravenna, Italy, 575: graphic symbol in complex structure at the end of the autograph subscription of a witness. Fig. 4: Ravenna, Italy, 7th. c., staurogram and χμγ-group at the end of the so-called short final datation written by a notary. Fig.5: Lamorlaye, France (Merovingian Kingdom), 673 March 10: autograph diagonal cross (or letter χ) of Childebrando, an illiterate man. Fig. 6: Pisa, Italy (Lombard Kingdom), 748: graphic symbol in complex structure at the end of the autograph subscription of the bishop of Pisa. Fig.7: Pisa, Italy; (Lombard Kingdom), 730 January: autograph greek cross of the illiterate clerk Candido. New in NOTAE Project is also the idea of considering the graphic execution of these symbols as a matter of the scribal culture, as – we could say – the ‘other side’ of the written world, and consequently as an object of palaographical analysis. A tendency toward alphabetocentric bias charac¬terizes palaeographical studies in general and it too often happens that what appears as something other than a written line is classified as ‘doodle’, if it is not immediately recognizable as ‘alphabetical sign’. So it happens that ‘doodles’ are implicitly elevated by palaeographers to a fixed category of graphic objects, characterized by their certain ahistorical nature. The late antique and early me¬dieval pragmatic literacy is, however, a historical issue; Therefore not a single written line on a document is to be presumed a priori as being considered merely decorative or superfluous drawn by literates or illiterates who were bored or thinking about something else rather than writing something significant. A thorough investigation of this ‘other side’ of the written world can therefore provide precious insights about the spread of literacy as a whole. 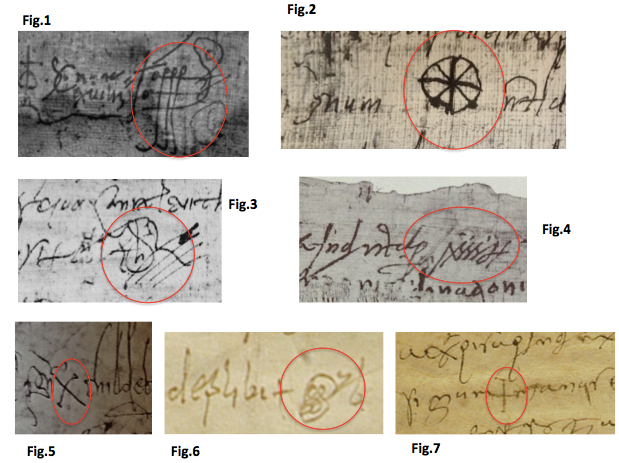 The available instances of graphic symbols will be investigated in their contemporary context as well as diachronically, bringing together methods developed in the fields of palaeography, diplomatics and history. Archaeology, sociolinguistics, social anthropology, history of christianity will also provide important methodological angles, in order to capture all the possible historical implications by studying their graphic execution as well as their models and cross-influences, their contexts and transmissions, and with the purpose to frame the category of ‘illiterates’ for each significant period and region involved in the wide historical and geographical span with which the project is engaged. Specific attention will be devoted also to the studies about the presence of symbols in manuscripts of the literary tradition, one of the most interesting research topics in recent years. to conduct comparative and diachronic studies on the basis of the results of the objective 2 and employing the NOTAE-Database. Starting from the purpose to know ‘who drew what’, ‘when and where’, ‘how and why’, the project aims to historicizing graphic symbols as material traces left by human hands on the border between written and oral culture, educated literacy and poor graphic abilities of illitterates. the survival of tachigraphic notes and Tironian notes in the pragmatic literacy of the post-Roman West. The NOTAE project will impact greatly also on the studies in diplomatic semiotics of the high middle Ages: it will make clear the historical background of the symbols of that later period, in which there is no more ‘vertical communication’ in latin language between literate elites and the illiterates. And finally the NOTAE-Database as final result will represent a repository of graphic symbols collected in original documentary sources from Late Antiquity to early Middle Ages: an evidence-based historical and dynamic Atlas of a graphic inheritance from the past, which will be available to all those scholars, who will be somehow interested in these historical objects and in what they can still say as historical sources.